In the early 1990's, Bill Hoffman was an Assistant Director with the Texas Water Development Board and in 1997 helped develop the "Texas Rainwater Harvesting Guide" which later was revised and expanded to be the "Texas Manual on Rainwater Harvesting" or "blue book" as many knew it. 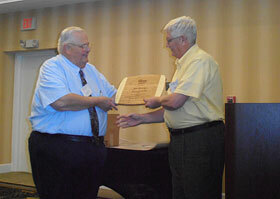 They were also the first statewide publications on rainwater harvesting in the USA. In 1999 Bill Hoffman became the Vice-President of ARCSA as Dr. Dennis Lye of USEPA became the second President of ARCSA after Hari Krishna, the first president. In 2000 Bill retired from the TWDB and took a position with the City of Austin, in the Water Conservation Program. While there, he worked to promote development of on-site sources of water and administered rebate programs that included rainwater harvesting. During his period with the City of Austin (2000-2007), Bill worked with others to convince the Texas Legislature to provide sales tax and property tax exemptions for rainwater harvesting and other conservation provisions. He joined the first Water Efficiency Advisory Group for the US Green Building Council's Leadership in Energy and Environmental Design (LEED) to develop LEED credits for water conservation including rainwater harvesting. He was on the original American Society of Heating, Refrigeration, and Air Conditioning Engineers (ASHRAE) 189.1 Standard for High Performance Buildings, and he is currently a member of the ASHRAE 191 Water Efficiency Standard Committee where he promotes all forms of on-site use. And, he was also a charter member of the International Association of Plumbing and Mechanical Officials (IAPMO)'s Green Plumbing and Mechanical Code committee where he currently chairs the committee on Alternate Water Resources. Mr. Hoffman is currently the Senior Technical Advisor for the firm Water Management, Inc.(WMI). One of WMI's specialties is using rainwater harvesting in conjunction with its stormwater management designs. Mr. Hoffman is a "Life member" of ARCSA, remains a loyal member of ARCSA and works to promote rainwater harvesting within the state of Texas, as well as across the nation.